From my notes, I present a digested message by our Pastor Allan. When we search with all our heart, we shall find him. The Glory of God is Shabbat which means rest and peace to our spirit. The glory may seem like a blanket enveloping our spirit. It is through Jesus death on the cross and his resurrection that we now have access direct to God our Father. When Jesus died, the veil was torn allowing us entry into the holy of holies. You may boldly enter the throne room and let Him change you. Sit in His presence and allow the Holy Spirit to minister to you. God has something for you, but you must reach out and receive it. May your life affect others as you radiate Christ. Enoch walked with God and God took him where never man had been before. The more we seek Him the more we find Him. 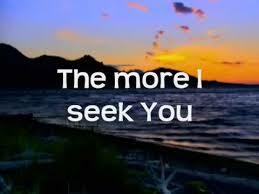 Jeremiah 29:13-14 And ye shall seek me, and find me, when ye shall search for me with all your heart. And I will be found of you, says the LORD: and I will turn away your captivity, and I will gather you from all the nations, and from all the places whither I have driven you, says the LORD; and I will bring you again into the place whence I caused you to be carried away captive. After all these years of following the Lord, I still need to go deeper. Deuteronomy 4:29 But if from thence thou shall seek the LORD thy God, thou shall find him, if thou seek him with all thy heart and with all thy soul. How do we go about seeking the Lord? Add to that your own personal reading and study of God’s Word. Don’t eliminate portions of the Bible that you don’t agree with. God’s Word is a living thing. Take God’s word and store it in your heart. Memorize important scriptures; such as John 3:16. God’s Word is treasure, and there will be times you need it to guide, comfort, encourage and even exhort you. Let the Word burn and purge and make you like Jesus. God’s Word will produce fruit in you. Our responsibility is to share the Word of God. When we are rebuked, by the Word, Stop and line up your life. Hear God’s voice and obey. Seek wisdom and with it seek understanding. Treasure hunters give their whole life hoping to find treasure. God’s blessing over His Word will bring us Spiritual and emotional treasure. Because God is our source, He will provide provision for you. Is Face Book controlling you? I am not telling you to get off Face Book, but don’t allow it to take up too much of your time. I challenge you to take one week off Face Book and fast Face Book. What I am really asking you to do is to seek God, and get in the Word, along with some praise and worship at home. Consciously take steps to seek God during times when you were once wasting time. 14 years ago, I was running from God and I flipped on the TV and the program was a preacher who said, “Someone out there is addicted to Meth, but God is telling you from this moment on you are free.” I said out loud, “That is me.” And from that day I have never had another issue with Meth. We are saved, but some of us carry issues. God is our deliverer and offers us freedom. There is a misconception that all Pastors are Saintly and Perfect, but the truth is we are human like you with the same struggles in life. God is here today, and ready to deliver you. Reach out and grab freedom. When your mind begins to desire the old ways, remind yourself that you are delivered and walk in it. God wants all of us, our Heart, Our Mind, Will and our strength. Matt 22:37 Jesus said to him, You shall love the Lord your God with all your heart, and with all your soul, with all your strength, and with all your mind.